Range Fuels, Inc. has announced that it has produced cellulosic methanol from the initial phase of its first commercial cellulosic biofuels plant near Soperton, Georgia using non-food biomass. The first phase of the Soperton Plant operations employs Range Fuels’ innovative, two-step thermo-chemical process, which uses heat, pressure, and steam to convert non-food biomass, such as woody biomass and grasses into a synthesis gas composed of hydrogen and carbon monoxide. The syngas is then passed over a proprietary catalyst to produce mixed alcohols that are separated and processed to yield a variety of low-carbon biofuels, including cellulosic ethanol and methanol. The cellulosic methanol produced from Phase 1 will be used to produce biodiesel, ultimately displacing diesel oil in transportation fuel markets. It may also be used to displace diesel in heating applications, used as a fuel additive in gasoline-powered motor vehicles, or used to power fuel cells. 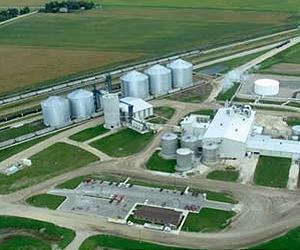 Range Fuels plans to begin production of cellulosic ethanol from the plant in the third quarter this year. The cellulosic ethanol will meet ASTM standards for fuel-grade ethanol and will be used to displace gasoline in local and regional transportation fuel markets. “We are ecstatic to be producing cellulosic methanol from our Soperton Plant, and are on track to begin production of cellulosic ethanol in the third quarter of this year,” said David Aldous, Range Fuels’ President and CEO. “This milestone is a giant step in overcoming the technological and financing challenges facing the commercialization of cellulosic biofuels and positions us extremely well to expand production of cellulosic biofuels. The Soperton Plant will initially use woody biomass from nearby timber operations, but plans to experiment with other types of renewable biomass as feedstock for the conversion process, including herbaceous feedstocks like miscanthus and switchgrass. Range Fuels plans to expand the capacity of the plant to 60 million gallons of cellulosic biofuels annually with construction to begin next summer. The Soperton Plant is permitted to produce 100 million gallons of ethanol and methanol each year. 4 Responses to "Cellulosic Methanol Produced From First Commercial Cellulosic Biofuels Plant"
i am very much interested with your info,thanks a lot! What’s up colleagues, how is all, and what you wish for to say about this piece of writing, in my view its genuinely awesome in support of me. Nice web content. I cannot wait for to see through the others.